Washington, DC. (October 19, 2017) – Luxury interior design firm ForrestPerkins announced today that their project, Terrapin Row Student Housing at University of Maryland in College Park, developed by Toll Brothers Apartment Living, received the 2017 Multi-Family Executive Merit Award in Best Student Housing Project category. Each year, Multifamily Executive magazine honors the industry’s best and brightest with its prestigious MFE Awards competition. ForrestPerkins’ and Toll Brothers’ Apartment Living award submission was one of 37 winners in 21 categories. 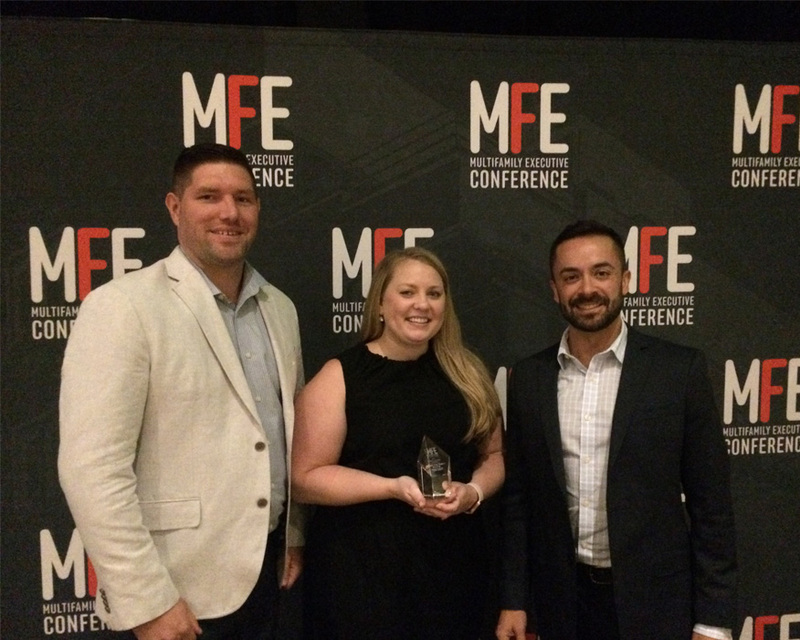 John Piedrahita, Marketing Director for Toll Brothers, and Emily Woods, AIA, Senior Associate with ForrestPerkins and an Architect and the Project Manager on the winning project, were recently presented with the award at the MFE Awards Ceremony in Las Vegas. Left to Right: Dustin Kinney of Toll Brothers, Emily Woods, AIA of ForrestPerkins, and John Piedrahita of Toll Brothers Apartment Living share the moment together after the awards ceremony. “We’re honored to have partnered with Toll Brothers Apartment Living on this outstanding project. Terrapin Row is a great success story that’s setting the bar for private student housing in the DC area and beyond. It’s a dynamic project that speaks to student life; current trends in communal living; and a feeling of home and comfort that helps to ground the residents,” says Sharon Bilbeisi, AIA, LEED AP, a Studio Leader for the ForrestPerkins DC office, and Principal-In-Charge on the award-winning project. The Terrapin Row project surpasses every expectation for student living and satisfies the rising need for student housing in the growing College Park community. Terrapin Row Student Housing is a three-building, 1500-bed development with 23,000 sf of indoor amenities and 15,000 sf of outdoor amenities. The 418-apartment complex received LEED certification for Neighborhood Development. ForrestPerkins’ expertise in luxury hospitality and multi-residential design informed an interior design for the project that would feel like a luxury apartment community, not student housing. Inspiration for the design was drawn from the desire to blend the warmth of home with interactive student community living. Therefore, the firm incorporated the latest trends in workplace design to provide the perfect intersection of live, study, and play. The vast amenities package includes a golf simulator, sauna, sunless tanning, game and lounge spaces, outdoor volleyball court, and pool. The areas for study are abundant, nestled on every floor of all three buildings and include intimate collaboration hubs with communal tables and soft seating groups in the public areas, in addition to private study rooms. The ForrestPerkins team chose a warm materials palette with reclaimed woods, exposed brick walls, and pops of bright red and orange to evoke a sense of the warmth of home. These design touches, combined with buildings’ clean lines, custom ForrestPerkins-designed murals, and dynamic sculptural lighting used throughout the public spaces convey the energy of the student population.